According to some sources, a civilian man was killed alongside two militants in an alleged coalition airstrike on Islamic State’s headquarters town of Ar Raqqah. 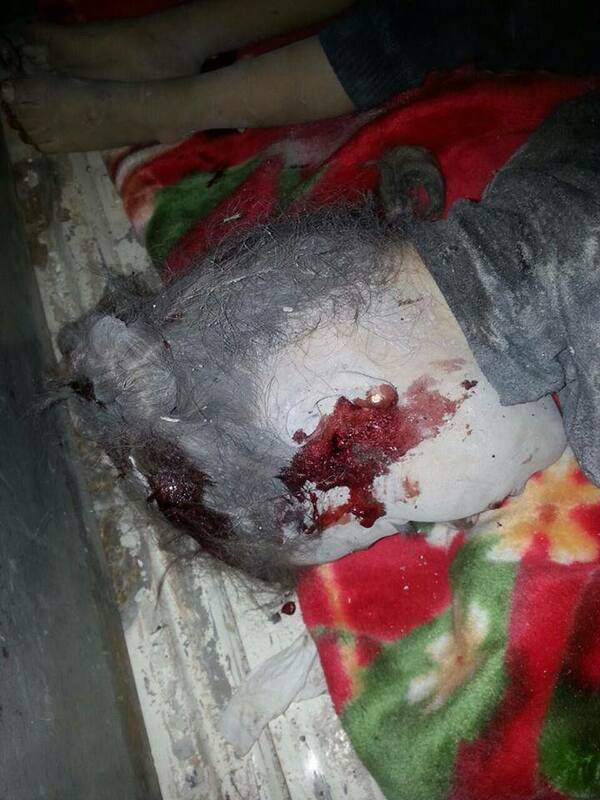 The slain civilian was identified as a resident of Ma’ar Shoureen in Idlib. 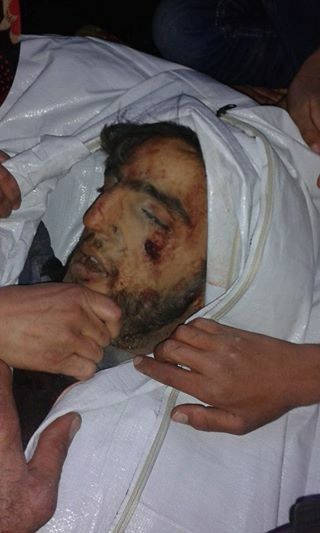 Two ‘Daesh militants’ were reportedly killed with him, one named as Mohammad Said Al Kaddour Nasser. No coalition airstrikes were officially reported at Ar Raqqah between November 10th-12th 2014. Two civilian men were reported by a number of sources as having been killed in a coalition airstrike. Two non-combatant males were reported killed in a coalition airstrike on the village of Sa’alo. 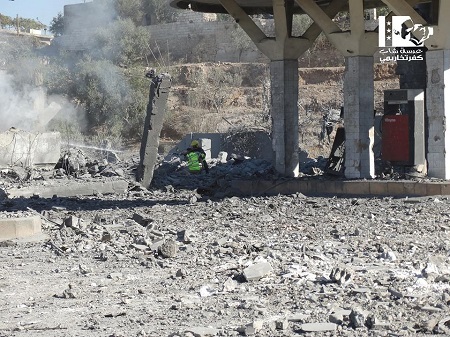 Further research by our Syria team indicated that this incident was in fact previously known to Airwars, but had not been linked to this specific location. At the time, a single source, the Violations Documentation Center, claimed that two male civilians, from the same family, were killed during a coalition airstrike on the village of Al Zir. This source was initially archived as separate incident S021. Further research found more than a dozen of other sources corroborating the death of the two victims, all stating the airstrike took place near al Tanak oil field in al Sha’itat desert. Subsequently, Airwars merged the two separate events into incident S023a on February 22nd, 2018. 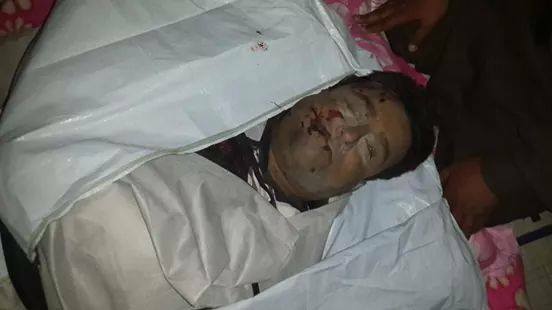 On the 10th and 11th of November, a couple of sources reported the death of one civilian male Abd Al Kader Ibrahim Al Saleh. We initially had this as a separate incident that took place on November 10th S025 but further research revealed this as the same incident. Syrian Human Rights committee specified that he died “due to injuries sustained in a coalition airstrike on al Tanak oil fields” a few days earlier. On the 11th another male civilian Rashed Hamdan Al Abd al Jassem was reported killed in alleged coalition raids on ‘one of the oil fields in the eastern countryside a few days ago’. We have this listed as a separate incident [CS028] but there is a chance these two incidents are linked. 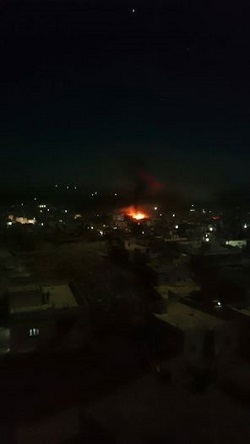 When Deir Ezzor Under Fire reported on the incident, they stated that it happened “an hour ago”, indicating that the airstrike allegedly took place around 11pm local time. Most sources identified the “International Alliance” or the US-led “Arab-International Alliance” as the culprit. The incident occured at 11:00 pm local time. Five civilian men were reported by a single source to have been killed in a coalition strike on the city of Dayr az Zawr. They were named by the VDC. The Syrian Martyrs website claimed that up to four unnamed children under the age of 10 died in a coalition airstrike on Mouka – described as one girl and two or three boys. The only coalition airstrikes officially reported for November 5th-7th 2014 took place at Kobane in Aleppo governorate, and at Tal Abyad (Ar Raqqah governorate.) Additional strikes targeted the area around Sarmada to the west of Aleppo. Six months after US air raids had targeted the Khorasan Group (part of the al-Nusra Front) and the militant group Ahrar al-Sham, the coalition finally conceded that two children had “likely” died in the attack – the first public concession of any civilian deaths after 4,000 airstrikes over nine months. The November 5th US-only raid targeted the villages of Harem, Bab Al Hawa, Sarmada, Reef Al-Muhameen and Binsh. 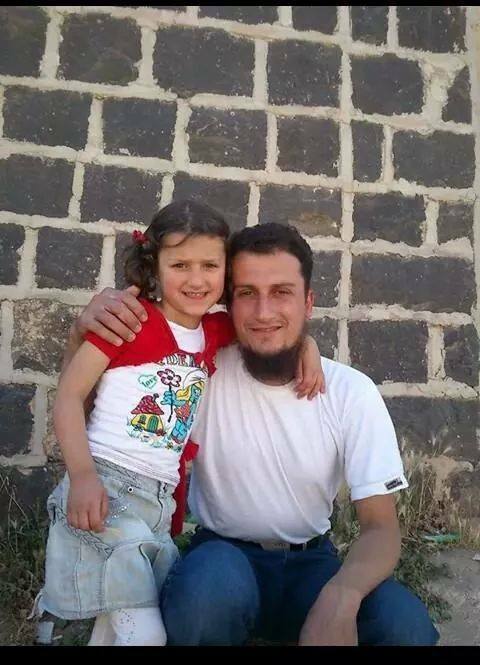 One of the children was identified as a five year old girl, whose father Ali Saeed Al Haj Qaddour – a fighter with the al-Nusra Front – also died in the attack (both pictured below.) Daniya’s mother and brother Saeed were reported to have been severely wounded. 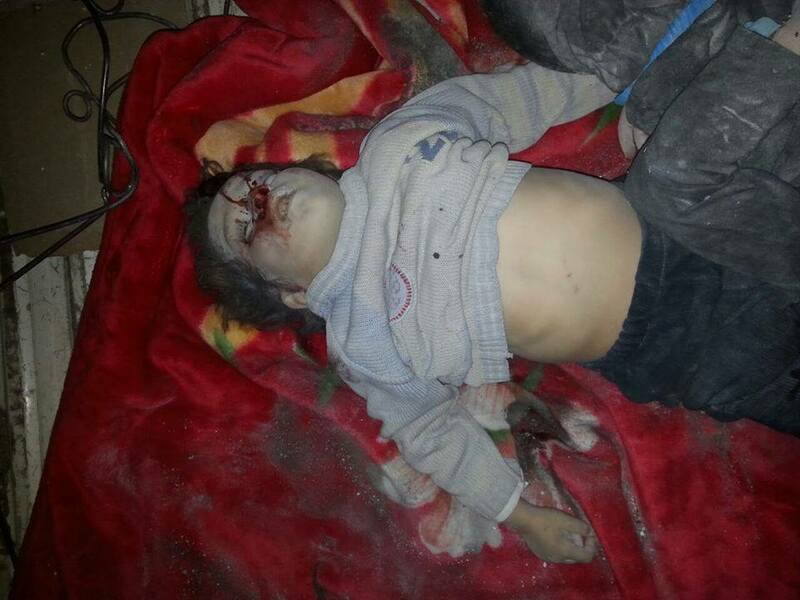 A second unidentified female child victim was shown alongside the body of Daniya in several graphic videos and photographs taken after the US bombing. VDC additionally reported the deaths of three or four unidentified male children in the coalition attack – though gave no further details. CENTCOM has accepted that two civilian NGO workers were also injured in the attack. Video showing the two girls allegedly killed in the strike, included in the SNHR report. Video purporting to dhow fires resulting from the coalition bombing on Sarmada on 5/11/2014. Published by ShaamNetwork S.N.N. Video purporting to show fires resulting from the coalition bombing on Sarmada on 5/11/2014. Published by ShaamNetwork S.N.N. Video purporting to Show fire crews attempting to put out the fires resulting from the coalition bombing on Sarmada on 5/11/2014. Published by ShaamNetwork S.N.N. Video purporting to Show extensive destruction in civilian homes in Harem. Video purporting to show extensive destruction in Harem following coalition strikes. This video was included in a SNHR report. Video showing the estensive destruction after the alleged strike. Video footage show civil defense teams in Al-Atarem area trying to find any victims underneath the rubbles in Harem city. 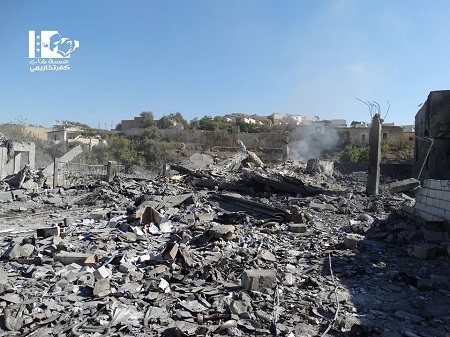 Huge signs of destruction allegedly caused by the international alliance’s shelling against Harem. 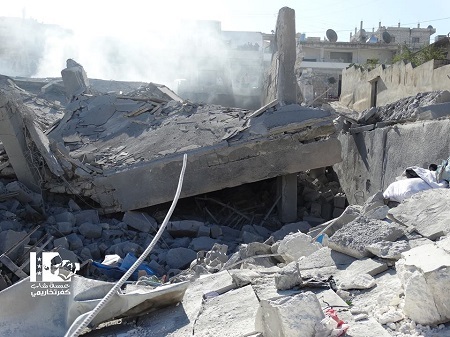 The preponderance of the evidence in the investigation indicates the airstrikes conducted against facilities used by Khorasan Group in the vicinity of Harim City, Syria, likely led to the deaths of two non-combatant children. From May declassified file: "CCWEBOPS received social media reports that civilians were killed or injured during a strike on a named objective in Syria. // TF nominated the target. SNHR report on CIVCAS. CFACC initially assessed that there was insufficient information to conclude whether the alleged CIVCAS allegations are credible. CFACC was unable to assess whether civilians were co-located with the targeted KG NAIs. After additional information was received, CJTF was tasked with conducing an additional credibility assessment based on the new information. 12/31/2014 JTF assessed this allegation that a child was killed during the strike as potentially credible. Investigation appointed 8 Jan 15 with a suspense of 22 Jan 2015"
An internal Coalition report noted that “Open source video indicated that three civilians were killed in a deliberate strike on an oil collection point in DeZ.” Airwars researchers have identified what they believe to be the [graphic] video in question, which was posted to YouTube on November 11th 2014. The Coalition was unable to verify the claims, though assessed that “No further inquiry required.” As an internal CENTCOM document notes: “Review could not determine that the video came from the strike in DeZ. Although there was a US strike on the oil collection site, the target was validated through the JTCB [Joint targeting Coordination Board?]. Targeting was mitigated – it was a night strike on a specific target where NCV [Non-Combatant Value] was assessed as 0, with mitigated weapons effects.